(Lancaster, Pa., May 15, 2018) - Three days shy of his 34th birthday, former Barnstormers left-hander Brandon Mann finally got the call. Sixteen years after signing initially with the Tampa Bay Rays, Mann received his first promotion to Major League Baseball on Sunday with a call up to the Texas Rangers. The left-hander from the Seattle-Tacoma area in Washington was immediately thrown into action, pitching 1 2/3 scoreless innings against the Houston Astros in their series finale on Sunday. Along the way, Mann has made stops in five different organizations. He has pitched in Japan for two years. There have also been two tours of duty in the Atlantic League, one with Southern Maryland in 2010 and another with the Barnstormers in 2014. Mann started the 2014 season with Class AA Altoona and joined the Barnstormers for the second half. In 20 appearances, six of them starts, the southpaw went 2-2 with a 4.09 ERA. He walked 17 and struck out 48 in 50.2 innings. The following season, he pitched for Fargo-Moorhead of the American Association. Mann has pitched in the Oakland organization, his fourth, over the past two years. He signed as a minor league free agent with the Rangers during the winter. This season, Mann had a stellar start at Class AAA Round Rock. In 12 appearances, the veteran allowed only eight hits in 17.1 innings of work and posted a 1.04 ERA. That body of work led to his promotion. 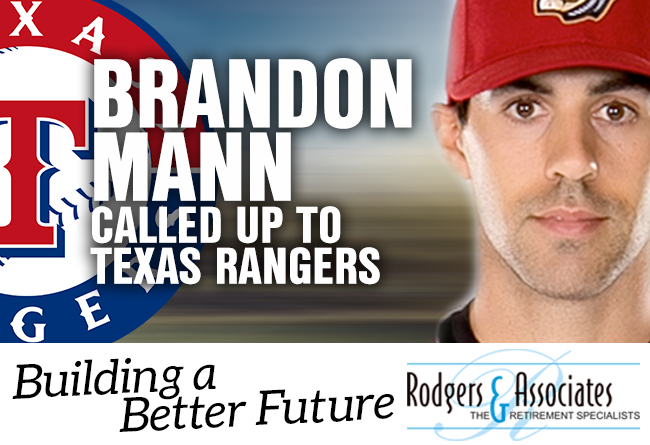 Mann becomes the second former Barnstormer promoted to the Texas Rangers over the last two seasons and the 12th to go from Prince Street to the Majors since the inception of the Lancaster franchise.